This is one of my favorite go-to quickie dinners. It’s so easy to make at the last minute and it’s healthy, too. We almost always have frozen salmon on hand from Costco. 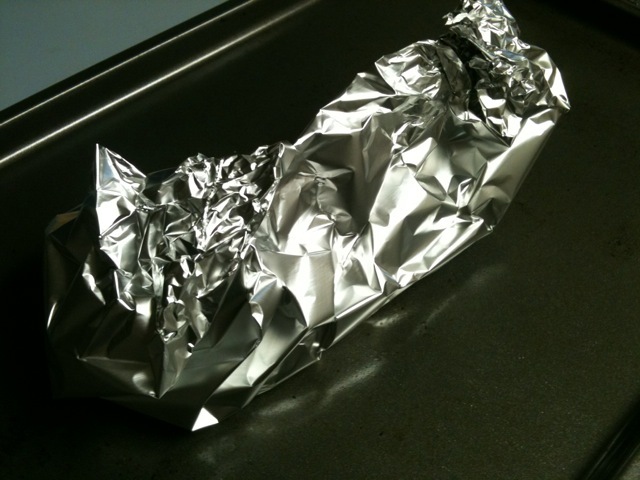 Defrost a piece of salmon and place it on a small piece of foil. 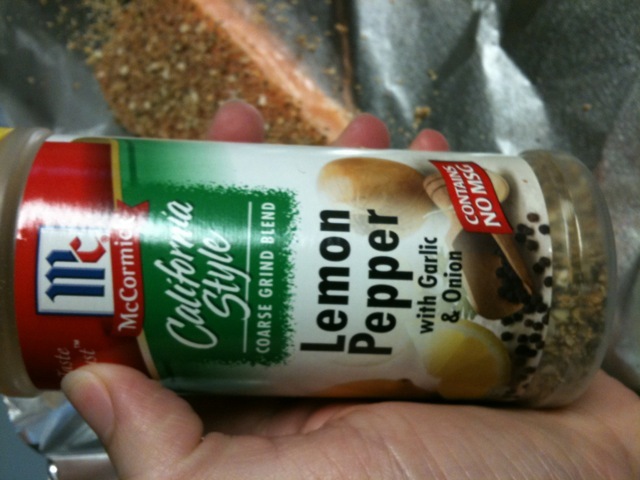 Use Lemon Pepper Seasoning. Sprinkle onto the fish. Add a few tabs of butter. 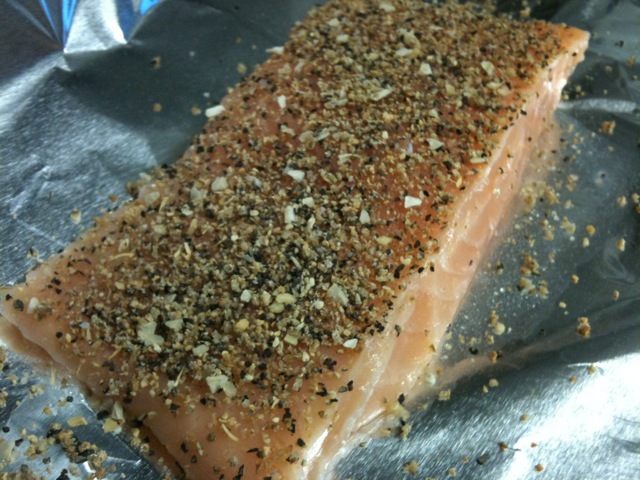 Loosely wrap the salmon in foil–not too tight. 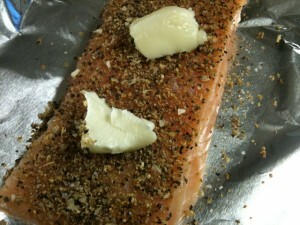 Place salmon on a pan and bake in the oven at 350 degrees for about 20-25 minutes. While it’s baking, steam some veggies. Check on the salmon around 18 minutes in. 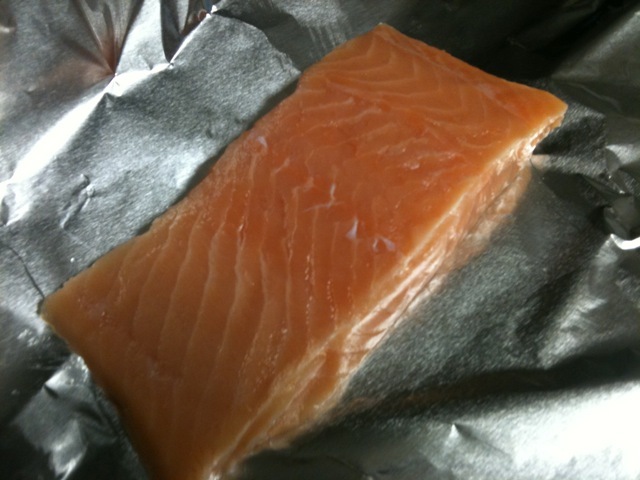 The rate of cooking can change depending on how thick or large the piece of fish is. 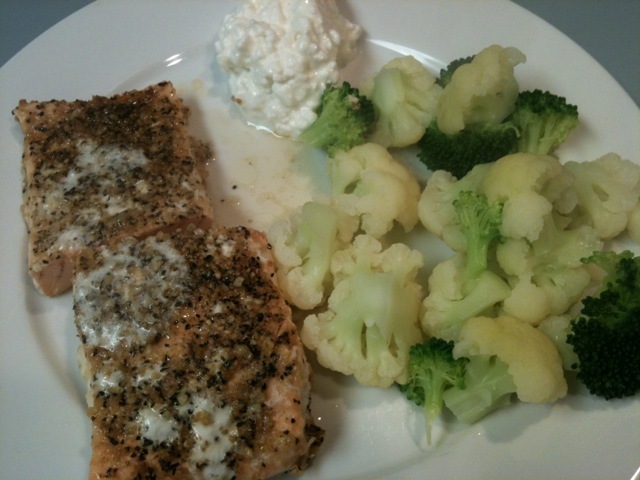 Add some cottage cheese to the plate for some extra protein. 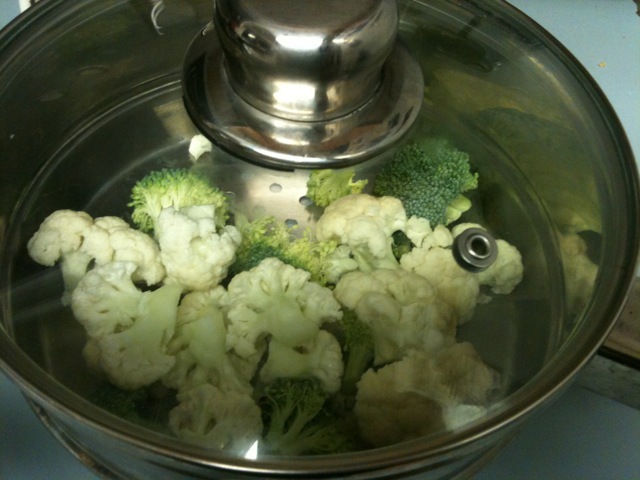 Top the steamed veggies with whatever you prefer: melted butter and salt, dressing, or plain. I use Goddess Dressing. It’s healthy and filling and the perfect fast dinner. 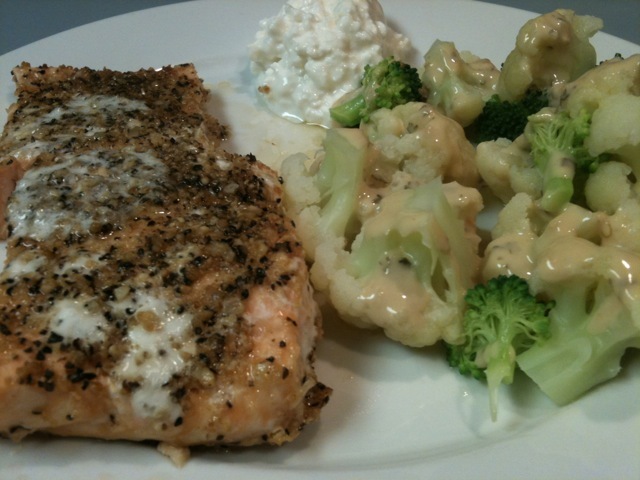 Salmon is a Super Food: low in calories and fat, high in protein and Omega-3’s. QUESTION: What’s your favorite Under 30 Minute Dinner? I looove salmon. I made a pizza last night on a tortilla that took only 15 minutes to make from start to finish since I didn’t have to bake the crust! I used sun dried tomatoes, mozzarella, and garlic gold on it. So good! That sounds delicious! I keep meaning to make my own pizzas on pita bread. I just haven’t yet. 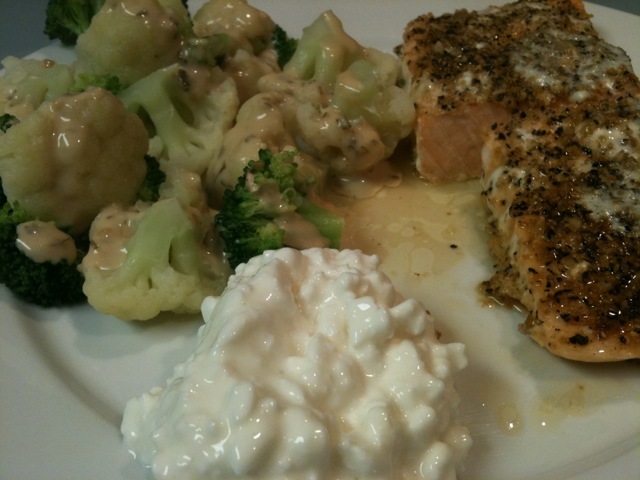 I really wish I liked salmon–it has so many health benefits. I just can’t do it. Is just salmon or all fish? If you liked halibut, that would work too! I’m thinking about going to Costco this weekend. Does defrosted fish really come out well? Do you do it by piece? Of course fresh is much better but I think the frozen Costco salmon is good. I don’t notice a difference. I’ve never had a bad experience with it.